Dietitian-approved menus make healthy eating much easier for anyone. For seniors, however, nutrition is especially important. A balanced diet promotes good health, improves many chronic health conditions and helps older adults enjoy a better quality of life. Making smart food choices isn’t always easy for seniors. Fortunately, at least for those living in nursing homes and residential care centers, the responsibility for good nutrition falls on the facility’s food service program. If you are struggling to improve the quality and nutritional value of your food service program, dietitian-approved menus and our helpful tips can help you with this challenge. As people age, their sense of thirst becomes dulled. In addition, many older adults take prescription medications that compound the effect. Proper hydration is essential to maintaining good health. For this reason, dietitians recommend offering seniors liquids throughout the day – not just at mealtime. Water is best, but unsweetened tea, black coffee, low-fat milk or 100% fruit juice can also be incorporated as part of a healthy eating plan for seniors. Left to their own devices, many older adults wouldn’t get enough of the nutrients they need to stay healthy. To that end, senior care centers must plan balanced meals for their residents well in advance. Dietitian-approved menus focus on including a variety of fruits and vegetables as well as whole grains, lean proteins and healthy fats. Planning ahead helps keep costs down and reduces food service staffing requirements. Seniors often complain that their food lacks flavor. That’s no surprise, since both our taste buds and our sense of smell decline with age. Some medicines can also influence how food tastes. Unfortunately, the go-to flavor enhancer – salt – is restricted in most senior diet plans due to its negative health consequences. As an alternative to salt, dietitians suggest adding healthy herbs and spices to boost flavor. Making foods more appealing can encourage older adults to eat more nutritiously. Most seniors can enjoy an occasional treat, like chips, cookies, candies or soft drinks. As part of a regular healthy eating plan, however, foods like these are not a good fit. Dietitians advise that these are empty calories, as they have no nutritional benefit. Instead, consider creating healthier versions of well-loved treats. Dietitian-approved menus often include low-fat, low-sugar snacks that are just as tasty as their unhealthy counterparts. Food safety is important for everyone. For seniors, it can be a matter of life or death. Because seniors have a harder time fighting off infections, eating contaminated food can result in dire consequences. Dietitians urge food service workers to handle raw food with care, keeping it away from other foods during meal preparation. Once cooked, food can only remain at room temperature for a limited time. After no more than two hours, cooked foods must be refrigerated. All food in the refrigerator, freezer and pantry should be clearly labeled and dated so it can be used before it goes bad. Sniffing or tasting food is not a reliable way to determine if it is safe to eat – when in doubt, toss it out. If you are not already required to do so by your county or municipality, send the members of our staff to a comprehensive food safety course every year. Choose a nationally known program such as ServSafe, or a local program certified by your county. If you would like more help establishing healthy eating programs for seniors, consider the Grove Menus program. 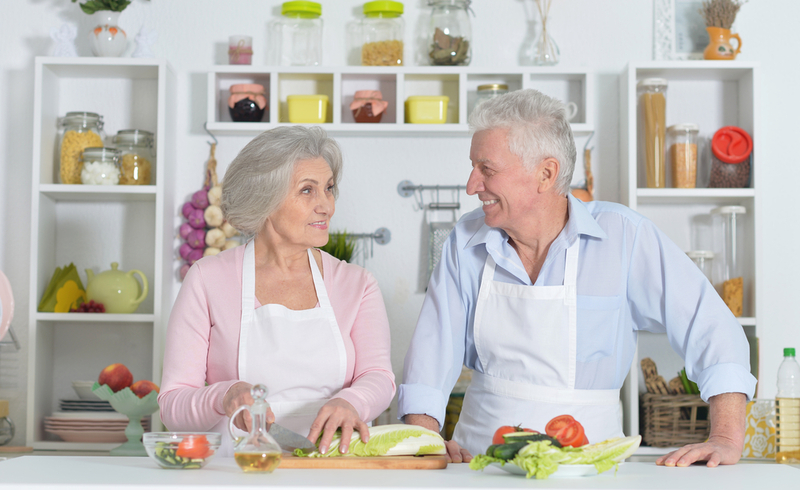 We offer a cost-effective, easy-to-use meal planning program designed around the dietary needs of older adults. For a free demonstration of our exclusive food service system, pre-loaded with hundreds of dietitian-approved menus, contact us today.